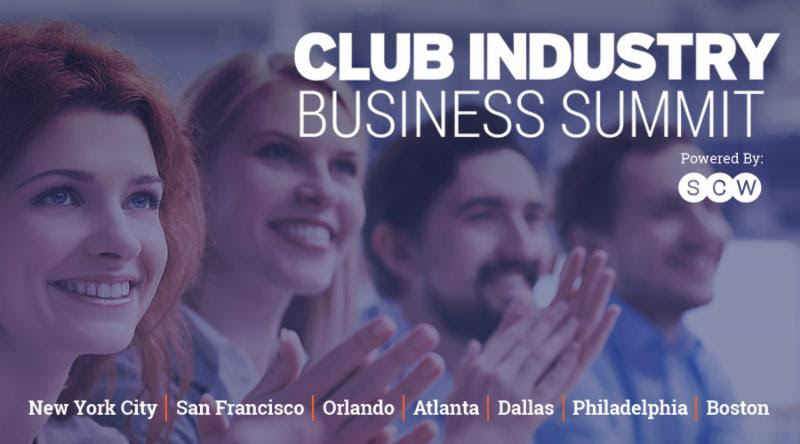 The Club Industry Business Summit comes to YOU, in YOUR CITY, in YOUR BACKYARD, at the affordable price of $199. Bring yourself and your staff to get a better grip on topics such as, proven sales strategies, member retention techniques that really work, the latest trends in the industry, and relevant social media lectures to keep you on top of the marketing game. Refuel, recharge and get ready for 2019 at these inspirational 3-day events offering a selection of over 40 workshops in New York City, San Francisco, Orlando, Atlanta, Dallas, Philadelphia and Boston. Why pay for expensive flights, hotels and overtime pay when you can attend over 40 sessions with 25 top entrepreneurs, business leaders and sales experts from around the country? Coast to Coast and Club to Club, these one-stop-shop Business Summits bring you 3-days of valuable education in NYC, San Francisco, Orlando and more! 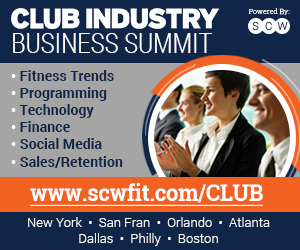 To find a Club Industry Summit near you, visit www.scwfit.com/CLUB. Club Industry is the most trusted media source for fitness business professionals through news and trends coverage, education offerings and in-person events. The Club Industry Show wrapped its 32nd year on Oct. 24-26, 2018, at the Hilton Chicago. Attendees included fitness professionals from commercial multipurpose and fitness-only clubs, studios, YMCAs, Jewish Community Centers, parks and rec facilities, university rec centers, hospital wellness centers, club management companies and others: www.clubindustry.com and www.clubindustryshow.com. The Club Industry Show is part of Informa’s Global Exhibitions Division. With over 200 trade and consumer exhibitions annually, Informa Exhibitions is a global market leader in such end markets as Boating, Beauty, Construction & Real Estate, Life Sciences, Maritime, Health & Nutrition, Agriculture and Pop Culture. Through face to face and digital channels, its transaction-oriented exhibitions enable communities to engage, experience and do business. In doing so, Informa brings together people who want to buy and sell, network, do business and gain inspiration. Industry insight, coupled with an innovative and entrepreneurial approach, provides Informa Exhibitions customers and partners with the opportunity to create business advantage and access markets. Business is built on a story. The story we are telling is not our own. We are not the hero. The heroes are our clients, the people we serve. The stories are their transformations. 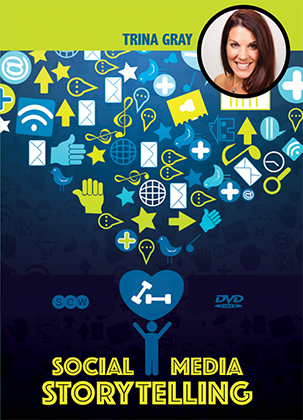 Let’s dive into our client stories and discover how to use them to better market our fitness businesses on social media. It is easy to do. It just takes a mindset shift from marketing what we do to marketing who we do it for. We can build our entire fitness brand on our clients who choose to make a change. We help them discover fitness, nutrition and new habits. They drop weight, kick smoking, get off medications, ditch their sleep machines, gain confidence, find strength and discover life. By telling that story, over and over, others will see themselves and want our expertise, support and services. Stories tug at people’s heart strings and stir up emotion. Stories move people to take action. The facts and figures, coupons and complicated offers we put out in the marketplace confuse people. Our client stories are our best marketing copy, our best headlines, our best social media posts. They are real, raw and relatable. They speak directly to people in a way that science or health warnings do not. There is one golden rule for marketing our services. Shine a bright light on others. This is very easy to do on social media. People are on social media for entertainment, not education. A picture and a story fits the medium and it is easy to add a simple call to action. For example, tell the story of the dad who lost sight of his health after college and finally made time to get in shape again. He is proud to be setting a great example for his kids. He is no longer just cheering from the sidelines, he is outside playing alongside them. Explain how his back no longer hurts, he has more energy and is even advancing at work. Add a call to action to tell other dads how they can get started on a fitness program too. Tell the story of the stay-at-home mom who threw herself into raising kids and lost herself in the process. She found fitness classes that she loved and her life changed. She made new friends and was inspired to prepare healthy meals for the family. She lost weight and found more self-esteem along the way. Add a call to action and tell other women how they can find their soulmate workout too. Who are you are talking to and what they need? If you need help figuring out your ideal avatar, look at your current clients. Who comes the most, refers the most and spends the most? Who do you enjoy working with? Who does your business best serve? Tell those stories to attract more of those people. We need to show more than a one client before-and-after picture recycled over and over. There is so much more to tell. We want to tell the story of when they join, when they stick with it and when they succeed. These are three key pieces of the journey. Often, we skip right to the final chapter and only show the result. That can be unrelatable. People want to see why clients start and how they did it. Here are three examples of regular, branded posts used on the Bay Athletic Club Facebook page that are easy to duplicate. We’d like to give a friendly welcome to new and returning members from the past week. Please help us congratulate them by sharing your favorite emoji in the comments below. These fit friends are students, working parents and retirees who are investing in their health. 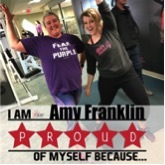 “In the last two weeks, Amy Franklin has lost 6 pounds. She is very proud. 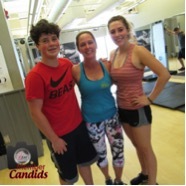 Amy is enjoying personal training and nutrition coaching with BAC Personal Trainer Amanda Freeland and attending group fitness classes. She has a blast working out and feels better about her role in the military. Every year Amy has to participate in a physical fitness test. She is excited that she’s not waiting to the fall to prepare for it. She’s working on her health right now and it is helping her in many ways. “Give it up for this fit family. High schoolers Mitch, Taylor and mom Pam Agius were all at BAC earlier today working out. Taylor loves to take dance lessons and ski. Mitch plays hockey and golf. Pam is triathlete who works full-time and is a wife and mom. They all make time to workout. Fit families are fun to cheer on. Give it up for the Agius crew! “Not long ago, Erin Andrews was simply worn out. As a married mom of three kids, a PE teacher and varsity basketball coach, she was taking care of everyone but herself. On top of that, her life had just changed dramatically. She and her husband Kolby were living in Texas. While she was pregnant with her third child, her husband lost his father to cancer. Soon after, she gave birth to her daughter, accepted two last-minute teaching jobs in Alpena, sold a house, bought a house, enrolled her boys in a new school, started a new job and took over the Girls Varsity basketball program. These massive changes all took place over six months. Erin dove into her new life and enjoyed being back home in Northern Michigan. However, she was struggling to keep up. She was often sore and tired for no reason. She saw a picture from her basketball banquet and did not recognize herself. She was 35 years old and had not worked out regularly since college. It was time to change. When her college friend invited her to Bay Athletic Club over Spring Break, she accepted. She dove into group fitness classes and never looked back. She works out four times per week, still juggling a very busy schedule. But now she is a priority, too. She adjusted her nutrition to add more water, replaces a meal with a superfood shake on most days. She eats better, but has never felt deprived or on a diet. She has lost more than 30 pounds and inches this year. She sleeps better and feels happier. She is stronger. When she started, she struggled to do a sit up, push up or hold a plank. Now she uses 15 or 20 pound dumbbells in strength class. Although it’s hard for her take a compliment, she appreciates it when friends, family and the staff at BAC notice her hard work. She knows she is setting a good example for her three kids, Evan, Owen and Avery about living fit for life. 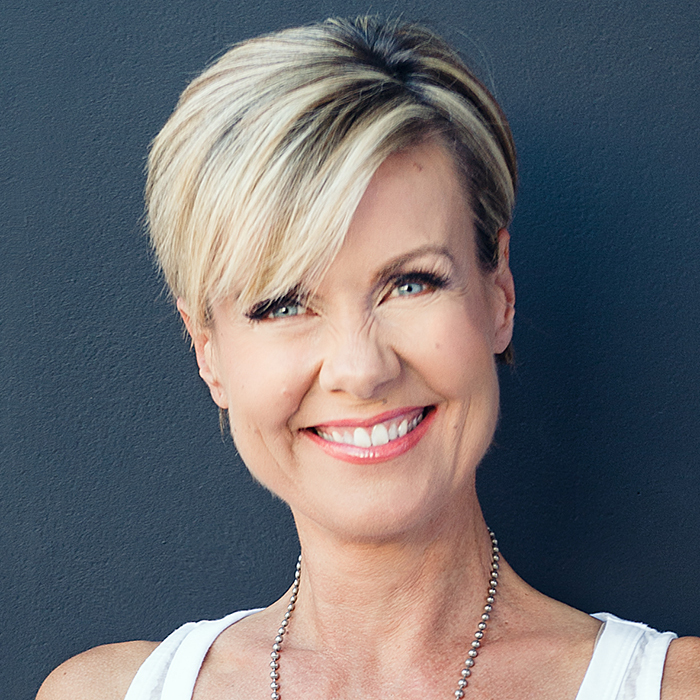 Trina Gray is an international fitness presenter and business mentor and has owned a medically-based health club & a large group training studio for more than a decade. Trina founded Team Rockstar Fit, an online coaching team of fitness professionals who partner with Beachbody. 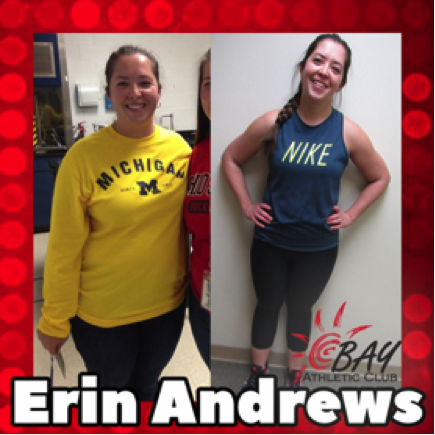 She won the Top 10 Small Business of the Year Award in Michigan, the CEO Award from Beachbody, the Community Service Award from IHRSA and the first-ever IDEA Fitness Leader of the Year in 2018. SCW Fitness Education is proud to introduce Stages Cycling available at SCW MANIA® conventions around the country. With the addition of Stages to our MANIA® conventions and fitness family, SCW will now have more fitness education on indoor cycling than ever before. Stages Cycling is an elite cycling company founded by Jim Liggett in 2009. The budding organization founded themselves on five core values: intelligence, creativity, listening, passion, and agility. From their values bore the desire to grow and innovate indoor and outdoor cycling all over the world. In 2012, Stages launched the design of it’s industry leading power meter for outdoor bikes and established a global brand reach that fueled it’s partnership with several world champion cycling teams and professional cyclists including Team USA, and 4-time Tour de France winner Team Sky. Stages Cycling continued its global growth endeavor with the introduction of the SC series of commercial indoor cycling bikes in 2015. The SC bikes feature proprietary innovations like FitLoc adjustments and SprintShift, as well as the Stages Power meter that utilizes the same technology featured in the outdoor power meter. Stages bikes can be found at all types of facilities around the world, from large club chains like LifeTime Fitness and David Lloyd Leisure to private cycling studios and now available at SCW MANIA®! Stages was built upon excellence with a desire to share unique and interactive certifications to ensure that participants and instructors not only receive the finest education, but they also have resources right at their fingertips for continuous learning. At SCW MANIA®, learn from the pros at Stages Cycling and meet them face-to-face! If you’re interested in registering for Stages sessions in NYC, visit: www.scwfit.com/nyc. Stages Cycling is an Associate Sponsor of SCW Fitness Education and will continue to have a presence at SCW MANIA® conventions throughout 2019. To find a MANIA® near you, visit www.scwfit.com/mania. Find out more about Stages Indoor Cycling online at: https://www.stagesindoorcycling.com/. My wife, Mindy, and I recently completed a medically supervised water-only fast (MSWOF) at the True North Health Center in Santa Rosa, CA. I water-only fasted for 8 days, and only Mindy fasted for 5. It was the most challenging and difficult thing I have ever voluntarily subjected myself to. So why did I do it? If you know me, you probably already know the answer: Good scientific evidence to support it. Fasting has been around as long as humans have. This most ancient healing tradition has been practiced by virtually every culture and religion on earth. If you think about it, humans MUST be designed for fasting because, until very recently, breakfast, lunch, and dinner were anything but assured. Our ancestors had to endure periods of both prolonged and intermittent fasting simply because food was not always readily available. Fast forward to today, and we have the polar opposite problem: Food, or more likely processed food like substances, are available and pushed on us 24/7, resulting in the chronic disease crisis that now plagues most of the industrialized world. Additionally, modern medical culture has created the norm that if something ails you, your doctor in all likelihood will prescribe some form of additional intervention, usually in the form of prescription drugs. Let me make this clear: The biggest threat currently to our health globally, is over consumption of disease promoting food. (1) Our western, allopathic medical culture embraces immediate intervention (again, usually in the form of drugs) to treat chronic diseases created by overconsumption of high calorie, disease promoting foods. However, as it turns out, for our most serious diseases of excess like hypertension, diabetes, heart disease, arthritis, and even cancer, the best prescription can be to do absolutely nothing and let the body use it’s incredible healing power to bring us back to equilibrium and homeostasis. And when I say do nothing, I mean literally, nothing but rest, sleep, and possibly meditation for an extended period of time. The longest recorded water-only fast was 382 days in 1971 by a 27-year-old man who shrank from 456 pounds to 180 pounds. At True North, people from all over the world are taking charge of their health and leveraging the scientifically proven health restorative benefits of medically supervised water-only fasting. 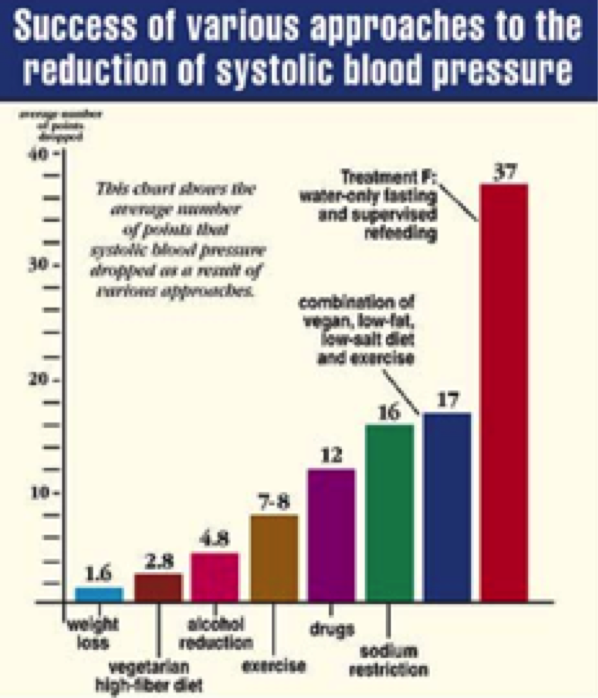 Founder of TrueNorth Medical Center, Dr. Allen Goldhamer, explained to me that medically supervised, water-only fasting can be more effective than traditional medical interventions in treating hypertension, diabetes, fibromyalgia, and arthritis. Why? Fasting treats the root cause of most of these diseases, while prescription drugs typically only treat the symptoms. Dr. Goldhamer will also tell you that these diseases of excess can be controlled (he does not like the term “cured”) as long as the patients transition to eating a whole food plant-based diet after their fast. His only prescription after completing a MSWOF is to eat a whole foods plant based diet with no added salt, oil, or sugar for the next 50 years. I spoke with Dr. Goldhamer in a recent interview which you can watch here: http://www.bruceandmindy.com/interviews/. So, why isn’t everyone diagnosed with the above conditions doing it? Because it is HARD to do. Almost everyone would choose drug symptom treatment over not eating for an extended period. Additionally, most doctors don’t know about the incredible benefits of WOF less actually prescribe it. When the digestive system completely shuts down, eliminating up to 30% of our daily metabolic activity, we use up the major reserves of our body’s preferred fuel, glucose. Our glucose reserves in the form of glycogen are stored in our liver and muscle tissues. Our bodies then turn to lipids (fat) as the primary fuel source and ketones are formed process to continue fueling our brain and pushing us into ketosis. Our immune system takes this opportunity to clean house through the cellular process of autography, which is the destruction of damaged or redundant cellular components within cells. Old cells and cell tissue are cleaned out and eliminated, allowing new stem cells to populate the body with fresh, healthy cells. In simple terms, it’s taking out the trash. Additionally, and just as important, the simple act of not eating removes the ROOT CAUSE of almost every major chronic disease we suffer from: excessive over-consumption of disease promoting foods. I personally chose MSWOF as an adjuvant treatment to cancer. True North has documented several case studies of actually dissolving stage IIIa lymphoma fibrous tumors. Additionally, there have been a few case studies showing positive results in slowing prostate cancer growth using MSWOF but they are limited. So, I thought, is there a downside to giving it a try? The biggest side effects are all positive, so why not? 1 week prior to water-only fasting: no alcohol, caffeine, or prescription drugs of any kind. 5 days prior: no grains or nuts. 4 days prior: no beans. 3 days prior: only steamed and raw veggies. 2 days prior: only raw veggies. 1 day prior: only vegetable juice. Re-feeding is basically the same protocol in reverse order, with the exception of a recommended, permanent elimination of all non-essential drugs, all caffeine, and all alcohol…forever. At TrueNorth, each patient is assigned an MD to monitor and consult with them during the duration of their MSWOF. I decided to aim for a 10-day MSWOF and to be monitored daily. Mindy and her physician decided to shoot for a 7-day MSWOF. Patients with high lipid reserves (excess body fat) have the ability to fast for 10, 20, 30 and even 40 days before initiating re-feeding. Mindy and I did NOT arrive at TrueNorth with high lipid reserves! I weighed in at 134 pounds prior to beginning my water only fast. For the duration, we were hungry, tired, had chronic lower back pain from our muscles dumping excess sodium and our kidneys having to filter it out. We both had plans to get a lot of work done coming in, but we did absolutely nothing, because we simply did not have the energy. My pulse was very low on the 8th day, and my doc recommended to begin re-feeding, which I did. With just a few sips of veggie juice my mental clarity returned almost immediately. After MSWOF completion, my PSA (blood surrogate marker for prostate cancer growth) rose slightly, which is indicative of cancer growth, but at a slower rate than prior to fasting. Not enough data to draw a conclusion yet, but only time will tell. Complete strength recovery took me about two weeks after completing the MSWOF. I feel great and plan on integrating a 5 to 8-day MSWOF once a year as an adjuvant protocol. The documented benefits are just too powerful to ignore. It is again worth mentioning, MSWOF is NOT recommended as a weight-loss tool by Dr. Goldhamer. MSWOF is a power tool to help you get your health back. He stressed in our interview that fasting of any type (water only or intermittent) will only be effective long-term if it is followed by a transition to a health promoting, whole-food, plant-based diet. Finally, DO NOT ATTEMPT TO DO AN EXTENDED WATER ONLY FAST WITHOUT MEDICAL SUPERVISION! Bruce Mylrea has a BA from the University of Florida as well as a Plant Based Nutrition Certification from Cornell University. Having done extensive research on dietary patterns and how it affects health, Bruce shares insights into the latest myths regarding nutrition, food, and its impact on society. He is currently Director of Sales for Savvier Fitness, an industry leader in creating innovative programs and products for fitness professionals. You can find Bruce at SCW MANIA conferences in 2019! Register for NYC MANIA®, February 22-24 at: www.scwfit.com/nyc. You can also register for the Club Industry Business Summit hosted exclusively at SCW MANIA® here: www.scwfit.com/nyc/clubindustry. Looking back, I now realize that some of my most memorable moments and magical memories were created when I messed up on stage and in public. Several of these moments happened at SCW events, and so you very well may have fallen witness to some of them. It is my guess that there are days when you, too, struggle with the idea that to be a successful instructor or trainer means being without fault. On the mornings when you find yourself in a dance with your brain, and perhaps focusing on the negative versus positive aspects of your teaching or coaching, I want you to remember that no one connects to perfect. In fact perfect is rather boring and bland. Here are five tips that will help you tap into your greatness, remind you to be kinder to yourself and help you enjoy your hard work as you elevate the craft of being a thought leader and change agent who is relatable, relevant and remarkable. As human beings we are conditioned to focus on the negative. It is said that negativity sticks to us like Velcro and positivity slides off us like Teflon. When we are in the present, and not obsessing about the past or worrying about the future, perfection and it’s baggage has no place to land. If you find yourself moving into a negative headspace, bring your attention to your breathing as this is your anchor to the present. Simply take a minute to pause, turn in and connect to your breath. Sixty seconds of listening to the gentle inhale and exhale of your breathing will allow you move out of any negative headspace and guide you into the powerful and positive present. Our brain is wonderful at creating “fake news” about our self. If left unattended, it will spin tales of dread and doubt into every possible situation. When we allow these negative (and false) stories to go unnoticed, they wreak havoc with our health and happiness. Ellen Langer, a professor of psychology at Harvard University, invites us to imagine that for 24 hours we have a thought bubble attached to our head. In this bubble reside all the conversations we have with ourselves, which are now out in the open for all to see. I invite you to explore how you talk to and work with yourself. Do you praise or criticize? Do you notice your strengths or only focus on your gaps? Do you recognize the areas where you work hard or only notice where you fall short? Check in with how you are showing up daily for yourself because you will never reach your full potential as a change agent if you are constantly breaking yourself down. When you find yourself talking to yourself (and please, tell me I am not alone here,) ask yourself this quick question: If I were to talk to my best friend in the same way I am talking to myself, would we still be friends? While we don’t want to reside in the past, our previous experiences contain valuable information that we can bring into our present. There is nothing wrong with looking backward if we do it with a light touch and use reflection versus rumination. When we reflect, we are able to see what went well, what we could do differently and what we may want to change completely should a similar situation arise in the future. The damage occurs when we look back without purpose. When our brain ruminates, it latches onto something that is already in the past and tries to change the outcome. Research has shown rumination is more damaging than self-blame when it comes to our well-being. When you find yourself ruminating and spiraling into a loop of negativity – S.T.O.P. This quick exercise will interrupt the negative spiral of judgment and criticism. It allows you to release the past, reframe your thoughts, and redirect your focus to create a powerful present. Sometimes it can be difficult to separate what we do from who we are. For those of us in the fitness industry, we are passionate about what we do and believe deeply in the work we are creating. This can be both a blessing and a curse. When perfection oversteps its boundaries and we make a mistake or take a misstep, sometimes we don’t see an error as “making a mistake,” and we view it as though we are the mistake. I like to remind my clients that there is data in the disasters and research in the rejections. When we are able to see mistakes as proof that we are stretching ourselves, flexing our courage muscles and stepping out of our comfort zones, we are able to put our perceived failures into context – F.A.I.L. Whether coaching one-to-one or teaching to a group of fifty, the person in front of you wants to feel seen, heard and valued. In the ever-changing world of technology where we are spending an average of 3 hours a day behind our smartphones, face-time (not iPhone FaceTime) is more important than ever. We connect by being human, not by being perfect. We connect in the real time moments, versus the moments captured on in today’s culture of social media. Often we use our screens to hide from the world, and there is nothing our negativity bias loves more than comparing our real life to the stories we see in our newsfeed. So, I invite you to give yourself a digital detox. If your music or your workout plan happens to be on your phone, wait until the last few moments to connect your device to the stereo etc. Prepare your playlists at home and prep your workouts ahead of time so you have an opportunity to practice eye-to-eye and heart-to-heart connectivity. I know we hear this every day, but to lead and coach well we need to show up authentically. This means learning to say, “I don’t know.” It will mean asking for help. And it will mean recognizing and praising others who may have talents and skills that we do not currently own. Authentic coaching and leadership involve vulnerability and a willingness to admit that we don’t have all the answers. Authentic leadership is not perfect leadership, but it involves more collaboration, brings more joy and strengthens more relationships. Authentic leadership resides in hope versus fear, and optimism versus worry. Here is the truth: To be the full package, a successful, dynamic and inspiring coach, you need to offer contrast. Hits and misses. Good days and not so good days. It is in the contrast that the creativity, curiosity and connection reside. Life is not black and white and neither is teaching, coaching or educating. Allow yourself to celebrate and savor your wins, relish in the unknown and realize that in the more challenging times you are training your resilience and grit. Now that you don’t have to be perfect, you can be amazing! 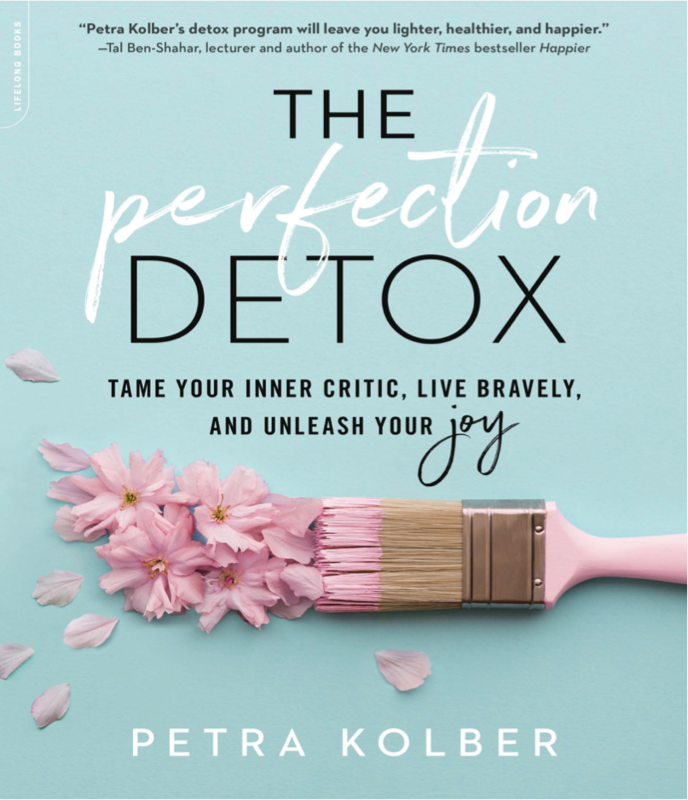 These tips can be found in more detail in my new book, “The Perfection Detox, Tame Your Inner Critic, Live Bravely and Unleash Your Joy.” It is available on Amazon, all major bookstores and also at PerfectionDetox.com. Meet Petra at SCW MANIA® in NYC! Visit www.scwfit.com/nyc to register for MANIA® or the Women’s Leadership Summit and Club Industry Business Summit available exclusively through SCW (www.scwfit.com/nyc/ClubNY). Do you want to reach more fitness influencers face-to-face and online? Let SCW Fitness Education help! We have a variety of ways your organization can Partner with SCW through unique Sponsorship, Exhibiting and Advertising Opportunities. We are affordable and flexible, and strive to work with you in an effort to craft the perfect partnership! Our MANIA® Conferences reach over 8,000 Fitness Pros in face-to-face contact each year at our 9 Regional Fitness events and 200k+ online through email and social media. See dates and show details at www.scwfit.com/MANIA & www.scwfit.com/CLUB. We are currently planning our three largest 2019 MANIA® Conferences – Atlanta (July 26-28), Dallas (Aug 23-25) and Midwest (Oct 4-6). Let’s set up a call to discuss how we can find the best fit for you! To find out more about partnership opportunities, visit www.scwfit.com/partner. For further inquiry, please email: partner@scwfit.com, or call 847.562.4020. Present at SCW Fitness MANIA® and Club Industry Business Summit! Interested in sharing your expertise with our network of fitness professionals? Apply now to present 90-minute fitness business lectures within our Club Industry Business Summit, and activity-based workshops at our MANIA® Convention. Get a chance to connect with our 35-year-old network of fitness pros all around the US! We reach over 8,000 Fitness Pros in face-to-face contact each year at our 9 Regional Fitness MANIA® conventions and 200k+ online through email and social media. See dates and show details at www.scwfit.com/MANIA & www.scwfit.com/CLUB. We accept applications on a rolling basis as we plan the schedule for each conference 5-6 months in advance. To find out more information about Presenting opportunities, please email: partner@scwfit.com, or call 847.562.4020. At POUND, we like to LOVE LOUDER! How do we do that? We eat with heart healthy ingredients so our hearts are as strong and as loud as our classes are! This month we’re lacing up our problem solving boots and attempting the impossible. Get ready for MIXTAPE MEALS! 15 heart healthy ingredients, 15 recipes+, under $70. No waste, low cost, endless ideas. It all started the first week of January. The new year resolutions were starting, but the SAME issues were coming up. We deal with a lot of them ourselves and we listen closely to our team at POUND HQ. “WHAT do I eat?” “WHEN do I eat it?” “WHY am I eating it?” “And HOW do I attempt to try new things without breaking the bank and wasting a TON of food?” We all know most of the answers to these questions. Most of them can be found in the BALANCE Nutrition Guide. But there’s a difference between knowing and doing. The constant issue wasn’t the question of WHAT is good for me, but rather HOW do I make it an everyday reality? How, when I’m feeling lazy on Thursday night and want to make a pizza run, do I make sure that I have all the ingredients I need to make a simple, quick, healthy and delicious meal? So, we decided to challenge ourselves. We’re taking this month to really get in there and MIX things up. We’re committed to making the solution a reality for us and our team. We chose 15 HEART Healthy ingredients (because Valentine’s Day!). Over the course of the next 28 days, we’re going to attempt to create at least 15 recipes+ with only 15 ingredients – and we ask you to join along! Create your own recipes and hashtag #mixtapemeal for the chance to be reposted on our instagram at @poundfit! Side Note: we didn’t include household items like salt, pepper, oils + vinegars, and condiments. Feel free to use what you have in your cabinet to add spice to your #mixtapemeal. On a serious note: Heart disease is a leading cause of death in the United States. It’s important to stay mindful of the things we put inside our bodies, where they come from and how they affect our health! 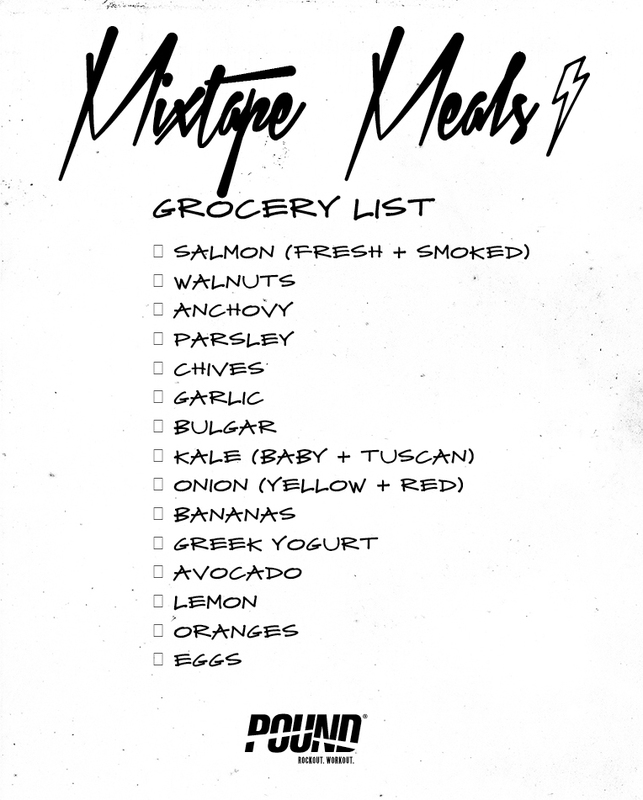 POUND POSSE – let’s get this MIX TAPE MEAL party started! We’re starting this week! Make sure you follow along on Instagram, Facebook and Twitter to see our creations and use #mixtapemeal when you create your own! 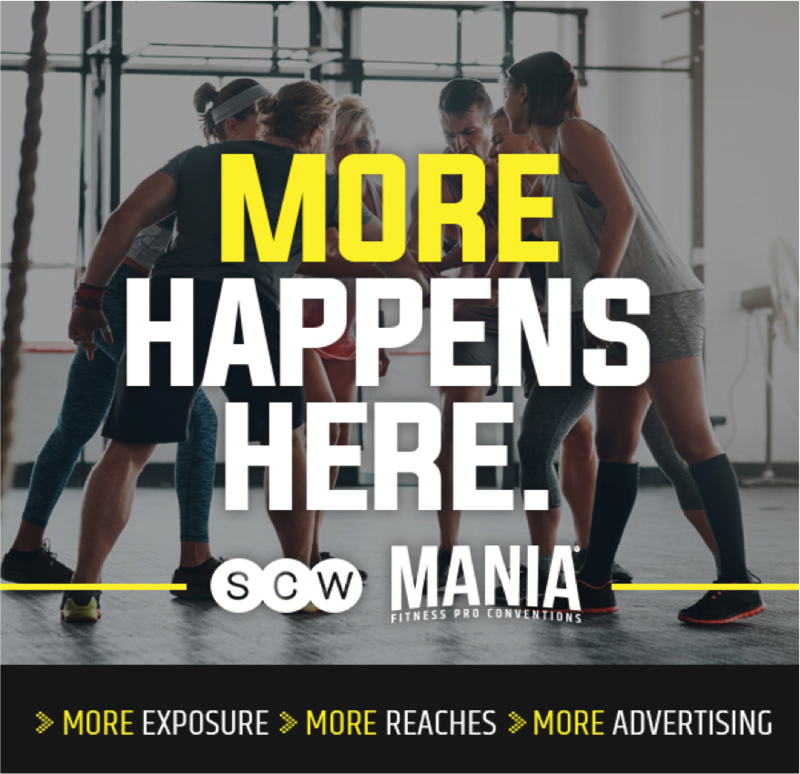 Find POUND sessions at SCW MANIA® in New York City, California, Florida, and more! 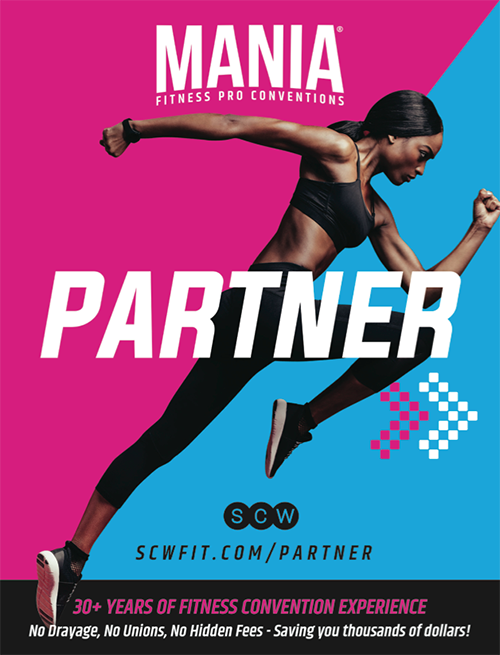 Visit (www.scwfit.com/nyc) or catch a MANIA® convention in a city near you at (www.scwfit.com/mania) and register today!